The holy birds of أبابيل (abābīl), خطاطيف (khāţaţīf) and سمائم (samā'im) – are they all Apus affinis? Sūrat al-Fīl (the Sura of the Elephant), the 105th chapter of the Quran, mentions "birds of abābīl" that threw stones on certain "owners of the elephant". According to most traditional commentators on the Quran, the "owners of the elephant" were an army led by Abraha al-Ashram, an Ethiopian ruler of southern Arabia in the mid-6th century, who raided Mecca in the year in which Prophet Muhammad was born (see for example, Tafsīr al-Jalālayn, or the commentaries of Al-Ţabarī). These traditional commentators interpret the whole phrase as "flocks of birds". The idea that the "birds of abābīl" are a kind of swifts or swallows can be traced back to Al-Damiri (1341?–1405), an Egyptian scholar who pilgrimaged to Mecca (Calvo 1997). In his book "The Life of Animals" (Ħayāt al-Ħayawān al-Kubra), he brings several traditions about the nature of these birds. One of them is attributed to Aisha (one of Prophet Muhammad's wives), and suggests that these birds closely resemble khāţaţīf (Al-Damiri, online edition 2010 by Al-Maktaba al-Shamela, 1:32), birds that are either swifts or swallows according to Al-Damiri's book itself (in the entries for khuţţāf, samā'im and sunūnū, ibid. 1:411, 2:38, 2:51 respectively). In the entry khuţţāf mentioned above, Al-Damiri writes, "[There are] several species of khāţaţīf, one species is accustomed to seashores, digs its house there and nests in it. Its body is small […], its color is gray and people call it snūnū [swallows]. […] There is also a species with long fine wings, accustomed to the mountains and eats ants. 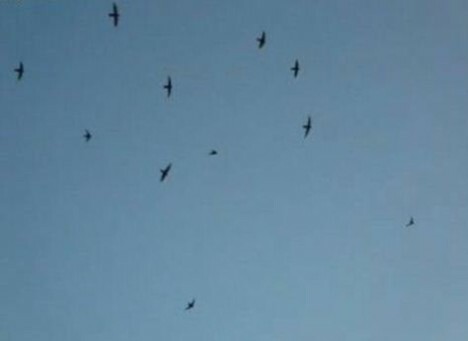 This species is called samā'im [swifts], and some call this species snūnū [swallows]. […] It is many in Al-Masjid al-Ħarām [the Holy Mosque] in Mecca. It nests in its roof, in Bāb Ibrāhīm [the Gate of Abraham] and in of Bāb Bani Shaybah [the Gate of the Shaybah Tribe]. Some people claim it is the birds of abābīl with which Allah tormented the Owners of the Elephant" (translation from Arabic by D. Kamir). This information became available to European scholars in the 17th century mainly through the work of Samuel Bochart (1599-1667). He cited the original Arabic text of the paragraph above, and translated it into Latin, in his book known as Hierozoici. In his citation, Bāb Ibrāhīm is rendered as Maqām Ibrāhīm (Station of Abraham). Al-Damiri does not make a clear distinction between swifts and swallows. He treats swifts and swallows as one species that breeds at the vicinity of the Kaaba, Maqām Ibrāhīm (Station of Abraham) and the former entrance to the Plaza, the Gate of Bani Shaybah. This observation marks the oldest precise nesting place of the holy places in Mecca (Tigges & Kamir 2013). As for the recent ornithology Jennings listed the swift species in and around Mecca today (Jennings 2010). The African Palm Swift Cypsiurus parvus, the Alpine Swift Tachymarptis melba and the Pallid Swift Apus pallidus are seen in the vicinity, while only the Little Swift Apus affinis is recorded as a breeder. According to the scholarly tradition and given that the living conditions did not change significantly, it is quite eligible, that Apus affinis is the species which was reported as Abābīl in the Quran seen by Al Damiri as Samā'im in the 14th century, and which is now recorded on the ABBA database (see Tigges & Kamir 2013).